Goslings Family Reserve is a popular Rum available from Amazon.co.uk in 70cl to buy online. Visit Amazon.co.uk for the best price for 70cl of Goslings Family Reserve or compare prices on our other Rum products. 155 years seems long enough. So the deep, dark secret rum that we Goslings have enjoyed for generations is now going public. Appropriately called Gosling's Family Reserve Old Rum, it is crafted from the same incomparable Bermuda blend that they use for their renowned Black Seal Rum. But, they leave it resting in oak barrels even longer, aging it until it has acquired an extra luscious, nuanced complexity much like a rare Scotch or Cognac. Consider it the ultimate sipping rum. A spirit this unusual deserves more than the usual bottle and label. So they lovingly take each bottle, hand label it, dip it in wax, number it, encircle it with a metal band and then place it in a straw-filled wooden box reminiscent of days past. The Perfect Old Rum Recipe: 1 oz. - blah, blah, blah 1/2 tsp. - blah, blah 2 oz. - blah, blah, blah Dash - blah Gosling's point? Old Rum is built to savour as it is poured. Add ice if you must, but nothing else other than a little eager anticipation. Awards - Double Gold Medal - San Francisco World Spirits Competition 2005. 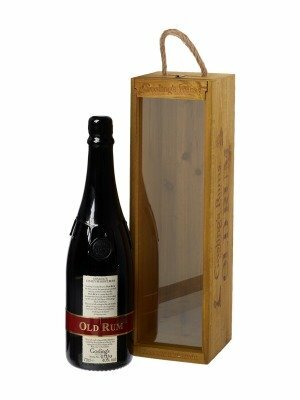 Gold Award, Premium Category - International Rum Festival, St. Johns, Newfoundland 2004. Where to buy Goslings Family Reserve ? Goslings Family Reserve Supermarkets & Stockists. You can buy Goslings Family Reserve online in most retailers and find it in the Rum aisle in supermarkets but we found the best deals online for Goslings Family Reserve in Amazon.co.uk, DrinkSupermarket.com, TheDrinkShop, and others. Compare the current price of Goslings Family Reserve in 70cl size in the table of offers below. Simply click on the button to order Goslings Family Reserve online now.